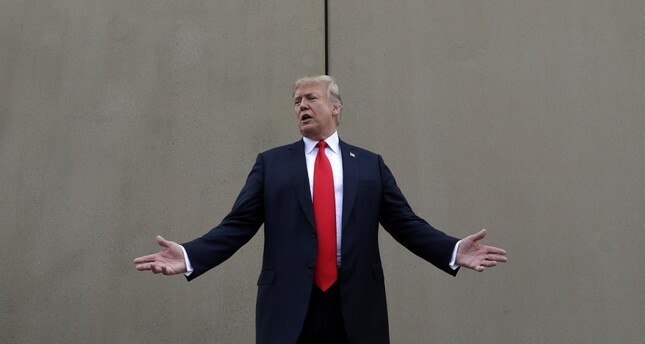 U.S. President Donald Trump speaks during a tour as he reviews border wall prototypes in San Diego, March 13. U.S. President Donald Trump's harsh rhetoric has created problems for many international actors. As soon as he came to power, Trump began to use punitive political discourse against both partner and rival countries. Eventually, the Trump administration had conflictual and tense relations with almost all global actors. Within this context, most of Trump's policies contradict international norms, principles and rules and he is considered a spoilsport by many of his counterparts. Moreover, as Trump started to question the status quo and violate the rules of the international system, other actors started to lose their trust in the global system. Even Americans began to question the foreign policy orientation of the Trump administration. As an example, a group of well-known professors from leading American universities published a letter entitled "Why We Should Preserve International Institutions and Order" in The New York Times on July 23. These professors claim that postwar international institutions such as the United Nations, the European Union, NATO and the World Trade Organization, which Trump attempts to destroy, help to provide economic stability and international security and provide vital benefits to the U.S.
Trump has been following a conflictual and unilateral foreign policy by using the deterrent power of his country. He is not concerned about the interests, expectations, and concerns of other states, and has declared most of its partners as enemies. According to media outlets, Trump has threatened the European countries that he will impose new customs against certain European products and withdraw the U.S. from NATO. Trump even claims that the EU is a "trade foe" of the U.S. According to him, all abnormalities and malfunctions in the international system that the U.S. faces emanate from other countries. It is obvious that Trump continues to face domestic critics and challenges. In order to get rid of all these critics, he often makes unexpected explanations about other states just for domestic consumption. Thus, he buys legitimacy by attacking the international system and by blaming other countries. Therefore, he began to threaten and attempted to punish G7 countries, NATO allies, the EU members, Russia, China, Korea, Iran and nowadays Turkey. The Trump administration openly supports the PKK's Syrian affiliate, the Democratic Union Party (PYD), and its armed wing, the People's Protection Units (YPG). The PKK is considered a terrorist organization by the U.S., the EU and Turkey. It also supports the Gülenist Terror Group (FETÖ), which is responsible for the July 15, 2016, coup attempt. And yet he threatens Turkey for the imprisonment of pastor Andrew Brunson, who is being investigated by the Turkish authorities for his links with terrorist groups like FETÖ and the PKK. In this regard, American politicians, diplomats and bureaucrats have begun to exploit every opportunity to blame Turkey on different issues. As a recent example, the American Ambassador to Cyprus, Kathleen Doherty, supported the Israeli and Egyptian ambassadors' threats against Turkey. The American ambassador did not mind supporting the representatives of the two states, who threatened Turkey, a NATO ally, with military intervention. The Turkish National Security Council said that the threatening language used by American politicians towards Turkey was disrespectful and unacceptable. The Turkish authorities declared that such language would only contribute to further tensions in bilateral relations. They called on American leaders to not use destructive discourse and warned the American side that it would cause irreversible damage to the relations between the two countries. For Trump, and especially the U.S., otherizing Turkey would not be a wise move. Unlike other European states, who base their relationship with the U.S. mainly on economic terms, Turkey – considering its geopolitical location – has leverage in terms of U.S. security and national interests. As a result, the Trump administration needs to be careful about the tone it uses and the policies it pursues with Turkey.